How stable is party identification? This essay refines and extends our argument (Green and Palmquist, 1990) that net of the distorting effects of measurement error, Americans' partisanship tends to be highly stable over time. Three challenges to this thesis are addressed. In response to doubts about the generalizability of our earlier findings to panel studies of longer duration or from other eras, we show that nine multi-wave panel studies yield similar results. Next, we take up the question of whether our model can account for observed patterns of partisan conversion. 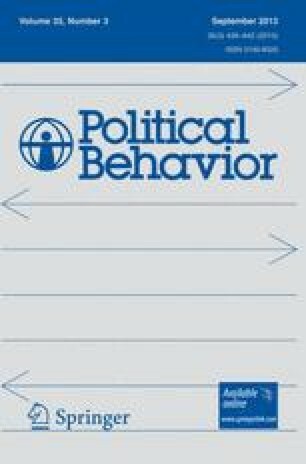 The rate of party-switching forces some modifications in the statistical assumptions used to model party identification over time, but a revised model which can account for inter-party change reproduces earlier findings of partisan stability. Third, we grapple with the question of how our findings square with fluctuations in what has been termed “macropartisanship”. We suggest that aggregate shifts in party identification need not be incompatible with strong over-time correlations at the individual level. Finally, we develop a simulation of micropartisanship to illustrate that over long stretches of time very gradual changes in partisanship can accumulate to produce appreciable levels of micropartisan change. Donald Philip Green, Yale University. An earlier version of this paper was presented at the annual Meeting of the American Political Science Association, Chicago, Illinois, September 3–6, 1992.